The band most known for its videos is looking for videos. 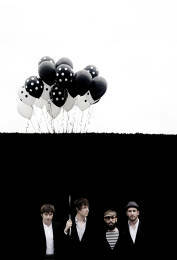 OK Go is a band famous for its intensely innovative videos. From its breakthrough treadmill trickery for “Here It Goes Again” to its automotive symphony for “Needing/Getting” or its paint-splashed Rube Goldberg extravaganza “This Too Shall Pass,” fans have grown accustomed to seeing something new with each new OK Go clip. The band has also been deeply involved in the creative concepts for their videos. Frontman Damian Kulash took on directorial duties for “Needing/Getting,” while Kulash’s sister Trish Sie has been a frequent directorial collaborator. So, for a band that gained fame through their video work, it’s interesting that for its forthcoming single “I’m Not Through,” the band is handing over the visual reigns to the 2013 Saatchi & Saatchi Music Video Challenge. Now in its third year, the Saatchi Music Video Challenge is presented in partnership with global creative platform Talenthouse and renowned music video curator BUG. From the submissions, 10 finalists will be selected by a judging panel that will include Kulash, members of the Saatchi worldwide creative board and BUG, and will be announced on the at the end of May. The Grand Prize winner will be invited to the Cannes Lions where their work will be announced and screened at the ever-popular Saatchi & Saatchi New Directors’ Showcase. The public will have a chance to vote for a People’s Choice winner, and the filmmaker with the highest number of votes will receive promotion from Talenthouse and OK Go’s websites. For more details on the competition and how to enter go here.